More riots across Greece look likely tonight after it emerged that the coroner may record a verdict of accidental death over the shooting in the chest of 15-year-old Alexis Grigoropoulos – and militants fear that a reported mobilisation of fascist paramilitaries could mean more deaths. It is yet to be officially confirmed, but a ballistics report has reportedly concluded that the fatal shot ricocheted off something before hitting Alexis. However trust in the police is low at this point, and such a conclusion will only serve to convince many that the police are closing ranks around their own, potentially sparking more anger. If the revelation brings more violence to the streets as today's general strike draws to a close, it could pitch police into a major conflict – and demonstrators are worried that they will simply let loose, bringing in lethal force and usng fascists as unofficial shock-troops to scatter the protests. Activists based in Patras, Northern Peloponnese, have said that a well-co-ordinated counter-attack by fascist groups may already be operating in concert with Greek police, after known members of Greek fascist group Golden Dawn slammed into the lines of demonstrators in the town last night. One writer reported: "Participation [in the anti-police demonstration] was phenomenal by the city's standards - around 3,000 people took the streets of Patras behind the anarchist banners and against state violence. "Toward the end of the demo however the riot police launched a major offensive, forcing it to retreat toward the city's university building. Soon after, the most incredible attack began: Tens of fascists assaulted the demonstration with knives and stones. Co-ordinating perfectly with the police, they continued their attack and, according to some reports, even did some joint arrests. "The demonstrators were confronted with the following unbelievable spectacle: They were facing a group of people throwing police-owned tear gas at them while chanting "blood, honour, Golden Dawn". The remaining demonstrators' block, numbering around 500, was completely torn apart; people were chased all the way into their flats; demonstrators had to seek refuge in flats in their tens and 20s, while the cops and the nazis smashed their windows and tried to force entry." 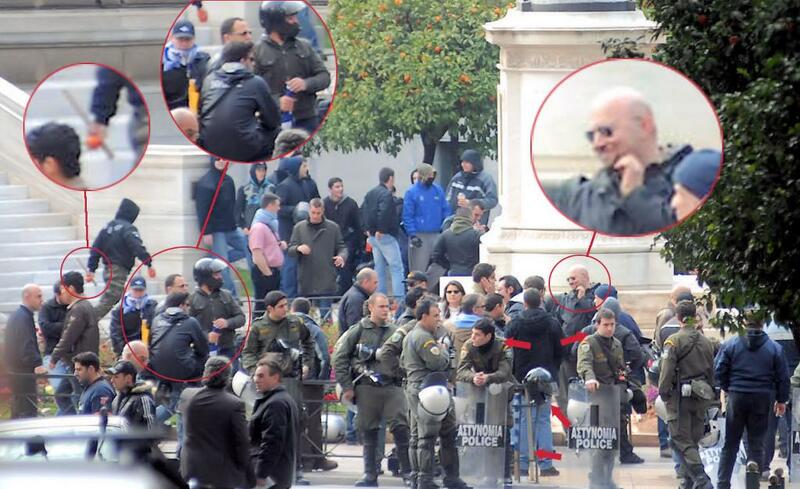 Police collaboration with the paramilitary organisation has been well-documented, with photos emerging in February of this year which showed Athens police sharing jokes with clearly armed Golden Dawn members before a street fight with anarchist groups (see picture). In Athens, similar attacks by small groups of fascists have occurred, leading to at least one stabbing, according to some reports. However a strong response from the immigrant community, who have for years been the victims of violent racism at fascist and police hands which led to the death of a Pakistani asylum seeker just weeks ago, may prove enough to put off further attacks, according to the Occupied London blog: "This is not a time to panic, of course – we have so many new allies on our side that if we play this properly the fascists won't dare strike again. "The attack against the police station of Zefyri shows this: Zefyri, in the outskirts of the city, is one of the most deprived (if not the most deprived) neighbourhoods of Athens, with a large Roma majority population. At about 10pm tonight, a crowd of around six hundred besieged the police station, attacking it with molotov cocktails while a flaming car was driven toward the building (though stopped by guards before reaching it)."